SUSPECT in attempted robbery of a Huntington Harbour bank this week (HBPD image). 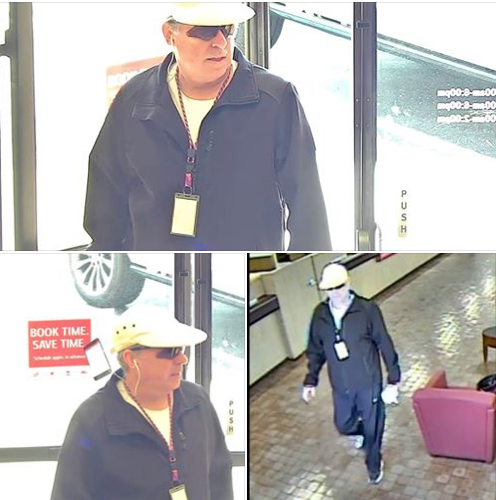 The Huntington Beach Crimes Against Persons Unit is seeking the public’s help in identifying the suspect who attempted to rob a bank on Wednesday. According to the HBPD, the suspect entered the Huntington Harbour Bank of America at 16811 Algonquin St. at 11:50 a.m. He presented a teller with a note demanding money and “simulated having a handgun.” But he was given no cash and left the bank and fled in the parking lot westbound on foot. Anyone who can identify this suspect (picture above) or has information related to the robbery is asked to call the HBPD at (714) 375-5066.